Parents are welcome to join the Google Summit in January, which will be hosted here at the school. Because ISD is the host, parents may participate at half price for the weekend. ISD is the first to host this technology conference in West Africa. Other professionals interested may also participate. Please see the linked announcement from our Technology Director, Rick Park, for the details on how to register and participate. Congratulations to our Volleyball Teams! Our ISD Volleyball Teams returned from the Accra WAISAL Tournament with two major wins! Congratulations to our Varsity Girls Volleyball Team, which for the second year running won the Championship! They won facing teams from much larger high schools. Excellent results Ladies! Congratulations to our Varsity Boys Volleyball Team, which won 2nd Place in their competition. In early December we will be hosting the WAISAL Soccer Tournament here at ISD. Please come out and support our valiant teams! We encourage our students to bring donations for this Holiday Drive for supplies for the Orphanage. These can be brought to the classrooms November 25 – 27. Classroom teachers have lists of the materials needed. The gifts will be distributed during the holiday period. In recent weeks I have had the pleasure of visiting several classes to observe students making presentations of their learning in the Upper School and also in the Lower School. It is a delight to see the level of active learning and the sophisticated presentation skills our students are developing. I have also given a couple of lessons from my repertoire. In one IB class I demonstrated aspects of translation, using a popular song from the Congo written originally in Lingala by Rochereau / Tabu Ley. The song was a subtle protest critical of one of Mobutu’s first despotic acts. I had first learned the song during my high school days in the Congo and it still remains popular today. 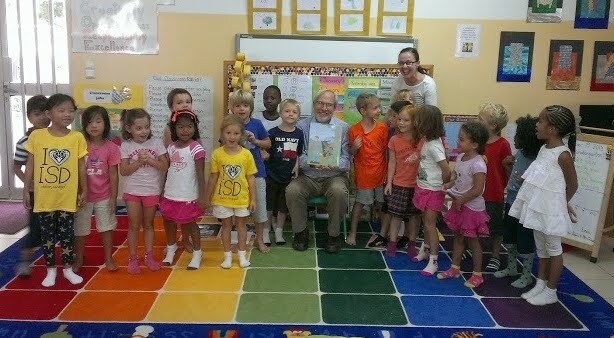 This past Tuesday was a special treat as I read a story to the Kindergarteners: The Man Who Lived in a Hollow Tree. I shared a picture I took last year of a giant tree that I’d seen in the Congo last spring, which is some 15 meters in diameter and reaches high into the forest canopy. We made a circle stretching our arms to get an idea of just how big around that tree actually is. I have to say our Kindergarteners are a very bright and imaginative group who are developing a beautiful sense of wonder about the world around them. What a pleasure to spend quality time with them!